The Dewey Bulldoggers will get back to business as usual this Friday after a bye last week. The Doggers are still riding the momentum of a blowout victory in a rivalry game against back on September 1. Dewey is currently 1-1 on the year heading into its final non-district game of the season. 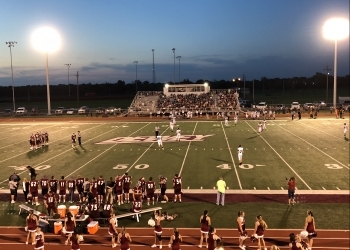 The Doggers host Vinita this Friday, a team they defeated last year, 41-20. The Hornets are also coming off a victory against Nowata. Vinita took care of the Ironmen 58-6 last week using a potent ground attack to run up the score. Dewey head coach Tyler Caid is gearing up for an old school ground-and-pound type of football game. The Doggers have a strong running game themselves with both Kale Cerner and Zane Lorenz going over 100 yards when the Doggers took on the Ironmen two weeks ago. While the running game is at the forefront of the offense, coach Caid is seeing confidence grow in his senior quarterback Chase Revard. Dewey hosts Vinita Friday night at 7 p.m. No radio for the Doggers this week.